A common whelk (Buccinum undatum). The common whelk (Buccinum undatum) is an inhabitant of coastal areas of the northern Atlantic Ocean, as well on the eastern coast as on the western coast. The whelk mainly lives in cold water with a salt content of around 2 to 3 percent. 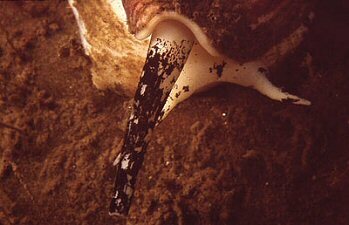 The whelk lives on different soils, but it is most frequently found on soft ground, for example muddy and sandy ocean floor habitats, in depths between 5 and 200 metres (15 to 600 feet). Whelks of different ages are used to live in different depths; the older whelks seem to prefer deeper sea areas, whereas the younger ones live near the shore. The whelk with up to 11 centimetres shell length (nearly half a foot) is one of the largest European snails. Its shell colour usually is hard to determine, because it either is camouflaged with an algae cover fitting the ocean floor, or covered with barnacles (Balanus). Like most other sea snails with a shell the whelk also possesses a lid (operculum) on its foot tip closing the shell aperture, when the snail withdraws into the shell. A common whelk (Buccinum undatum) during oviposition. Whelks have separate sexes. The time of their mating depends on the region they live in. In cold water areas the whelks mate in spring when the water temperature rises. On the other hand, in warm water areas such as the European Gulf Stream area the whelks mate later, in autumn, when the water temperature begins to fall. The female attracts the male with pheromones it begins to distribute into the water when the temperature is suitable. Internal fertilisation enables the whelk to produce egg capsules to protect the eggs. The whelk lays its eggs in whole capsule packets. The young whelks inside may come from very different fathers, as whelks mate several times and store the sperm cells until the outside conditions are suitable. Some of the egg capsules laid by a whelk are empty. Those are only for the protection of the young located further inside. Only one percent of the young hatch, though. That is also because the young whelks hatched earlier eat their younger siblings. Inside the egg the young snail undergoes several stages. However there are no stages of larval development in free water. 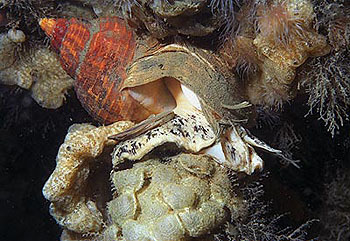 A whelk's life expectance, not counting the human factor, is about 10 to 15 years. Whelks are carnivores. Mainly they feed on worms, crustaceans, mussels and other molluscs. Shells and armours of their prey the whelk drills holes into to eat the soft interior. Whelks especially orientate by smell. They do so by using chemoreceptors in their osphradium, an organ inside the pallial cavity. The pallial cavity's opening is elongated to form a tube shaped organ called a sipho. With its good sense of smell the whelk is able to differentiate between a potential prey and a predator. On their way to their prey whelk can move by more than 10 centimetres per minute. A whelk on the search for food can be recognized by its swinging sipho helping it to locate the source of a smell. Mussels the whelk tries to outwit to be able to eat them. When it has found a mussel, the whelk waits in front of it, until the mussel has to open the shell halves. Then it is already too late. The whelk pushes its sipho between the shell halves and thus prevents the mussel from closing. Afterwards the snout with the radula follows the sipho. With its long sharp dagger-shaped toothlets the whelk rips pieces of flesh from the mussel's soft body, so that the mussel is eaten in short time. Some mussels try to protect themselves against whelks: One possible strategy is to keep the shell halves closed and to wait until the whelk looses patience and crawls away. The problem is that mussels cannot breathe with their shell halves closed and at some time have to open the shell in order not to suffocate. Other mussels move away as fast as possible. Then scallops are in advantage that can retreat by swimming. Other mussels such as razor clams dig themselves deeply into the ground to be protected against the whelks. 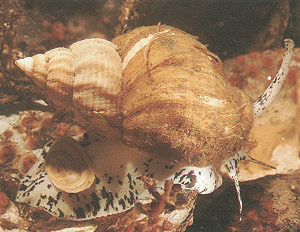 Whelks may also be a threat to black mussel beds.